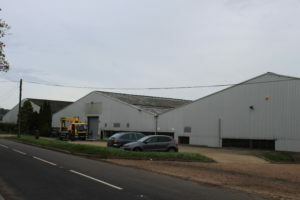 We acted on behalf of a Client looking to take a short lease of an industrial hanger in Redhill, Surrey. The hanger was in the region of 50 years old and in poor condition. Our Client was due to take on a fully repairing and insuring lease. The tenant was advised by his agent to protect his interests by limiting his future repairing liabilities so that he was not held responsible for repairs that were already evident. We were instructed to carry out an inspection of the building and take a photographic record of its condition. The inspection included all internal and external elements, including the use of an access hoist to allow the inspection of the roof, which was formed by a series of pitched structures. The condition of the roof was poor and the photographs highlighted the poor state of the corrugated asbestos roof and bands of glazing. There was extensive moss growth on the roof coverings, the asbestos sheets were cracking and becoming friable, and as a result a number of leaks were suffered internally. The roof was nearing the end of its economic life. Failure to record the condition of the coverings and limiting our Clients repairing obligations would have resulted in the client being held responsible for costly repair or replacement of the roof at the lease expiry. We prepared a Photographic Schedule of Condition and issued this to the Client which was then attached to the lease, limiting his future repairing liabilities.